If you are brand new to the concept of meditation, looking to start a meditation practice, or change up your normal meditation routine, meditation apps can help you grow and strengthen your practice. Based on your personal preferences, different apps will resonate more and work to create a sustainable and rewarding meditation practice for you. We tried and tested these five meditation apps so you do not have to download every app and waste precious mediation time trying to figure out the logistics and which is a best fit for you! General Layout: Pitched as a way to bring clarity, joy, and peace to the meditators' daily life, Calm provides services ranging from listening to your choice of over 30 unguided scenic background noise and accompanying photo to over 50 Sleep Stories created as adult bedtime stories to soothe you to sleep. Sessions range from 3 to 25 minutes in length to work into any schedule. There is also the option for different programs (e.g 7 Days of Managing Stress), guided meditations (e.g. Winnie the Pooh: Find wisdom with Pooh and Friends), and unguided meditations which can be timed or open-ended. To keep things fresh and interesting, there is a tailored and new 10-minute program added daily specifically for you. While some parts of the app are free, much of the app programming and guides require membership to access everything. Points of Interest: The app tracks daily streaks and time spent meditating as well as provides the option to share statistics and add meditations sessions that were not completed using the app. You can also set up mindfulness reminders and just breathe along with a calming breath bubble that increases and decreases in size when it cues time to inhale and exhale. Price (USD) as of July 2017 for United States users: An auto-renewing yearly membership for $4.99 per month billed yearly for $59.99, an auto-renewing monthly membership for $12.99 per month, or a one-time bill of $299.99 for unlimited lifetime access to the entire Calm collection. Fun Fact: They have a website, where you can meditate on your desktop. The screen looks busy at first but all the words will fade after a few seconds and you can listen and look at the beautiful scenery while you meditate. 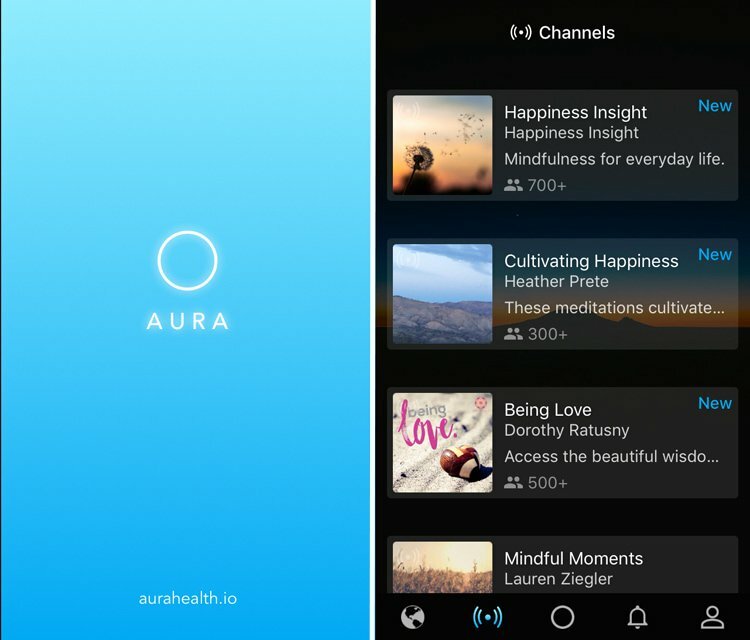 General Layout: Depending on your interest, Aura’s claim to be the most technologically advanced, simplest, and most effective meditation platform will either draw you in or turn you away. An AI-powered app that specializes in meditation for stress and anxiety, the app starts by trying to get to know you and personalize your platform. The meditations are guided and soothing, and link the breath with the body. There is the option to save meditations, rate them, and give feedback. They also nudge you to set up gentle reminders to meditate, and educate the user that gentle reminders improve the chance of creating a new habit by 370%. 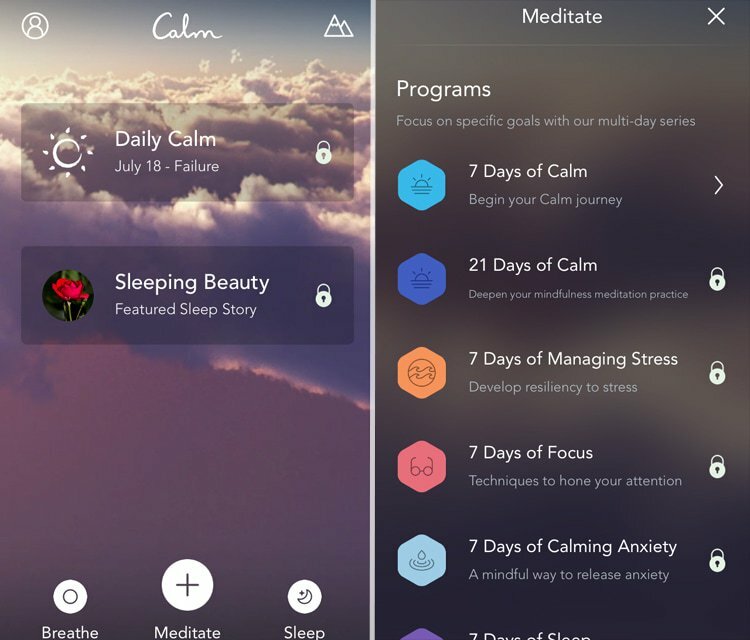 The app provides one free 3-minute personalized meditation every day. You can explore and subscribe to different “Channels” which have different mini meditations. The majority of meditations are 3-minutes long, although there was one 22-minute long meditation that I found. There are new channels added weekly. Points of Interest: There is a fun Mindful Breather feature that lets you synchronize your breath with a circle that expands and contracts to help you focus on timing your breath. You can set up reminders throughout your day to practice the Mindful Breather for 30-second intervals. The app also creates space for a gratitude journal and mood tracking system that helps you notice patterns and visually track your mood. Price (USD) as of July 2017 for United States users: Seven days free then $7.99 per month billed monthly, $29.99 for 6 months billed once with the option to cancel anytime, or $399.99 for a Lifetime purchase. Fun Fact: The app currently collaborates with entrepreneurs in developing countries through microloans and part of your 6-month subscription will support these entrepreneurs. Celebrated by Emma Watson via Twitter in 2013, Headspace has a range of mindfulness programs including mini moments of pause that take 1-3 minutes to packed programs for Work & Performance and Happiness. A bit for everyone and anyone, this app tackles topics such as interviews and fear of flying. Points of Interest: A personalized progress page and option to implement a buddy system to connect you with needed support to cultivate your goals. 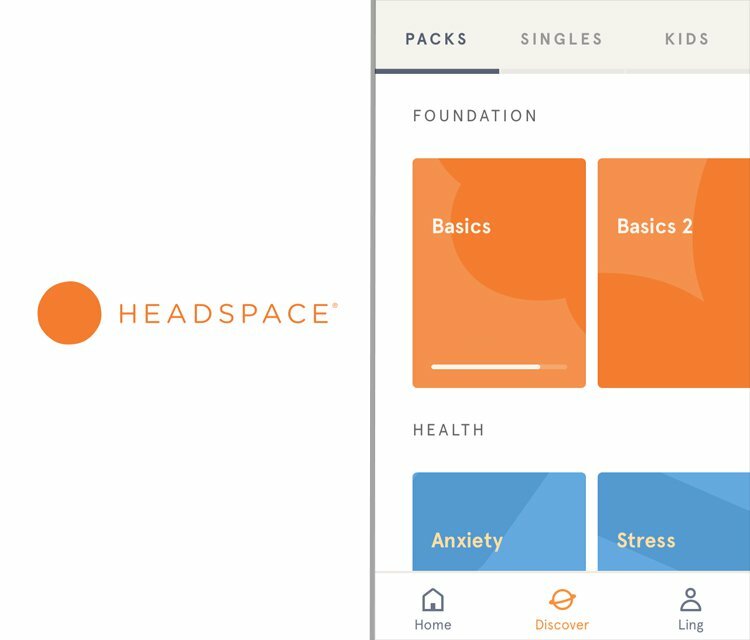 The free Take10 initiative is Headspace’s beginner-friendly program with daily 10-minute meditation exercises for 10 days. Price (USD) as of July 2017 for United States users: An auto-renewing yearly membership for $7.92 per month billed yearly for $95, an auto-renewing monthly membership for $12.99 per month, or a one-time bill of $399.99 for unlimited access for life. Fun Fact: There is a section for kids, categorized by age under 5-years-old, 6- to 8-years-old, and 9- to 12-years-old. 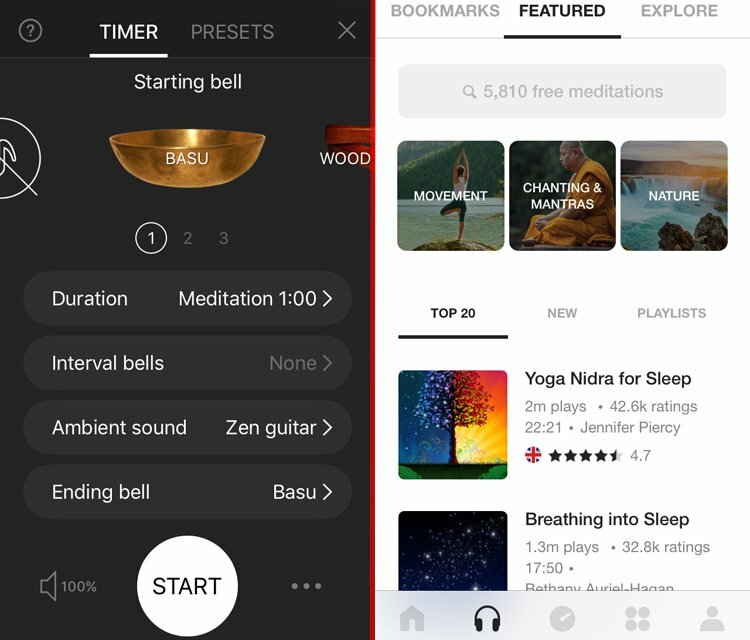 General Layout: Insight Timer strikes a balance for all audiences with the option for a simple timer paired with a Tibetan singing bowl, to guided meditations featuring Tara Brach, Sharon Salzberg, and Eckhart Tolle. The guided mediations have a podcast-like feel and has a strong community component and focus. You have the option to see who is meditating nearby, as well as message with friends on the app. It can be as simple or complex as you design. Points of Interest: In 25 languages, there are over 5800 free guided meditations from over 1200 meditation teachers. Fun Fact: Did we mention it's FREE? Free to download and no in-app purchases. 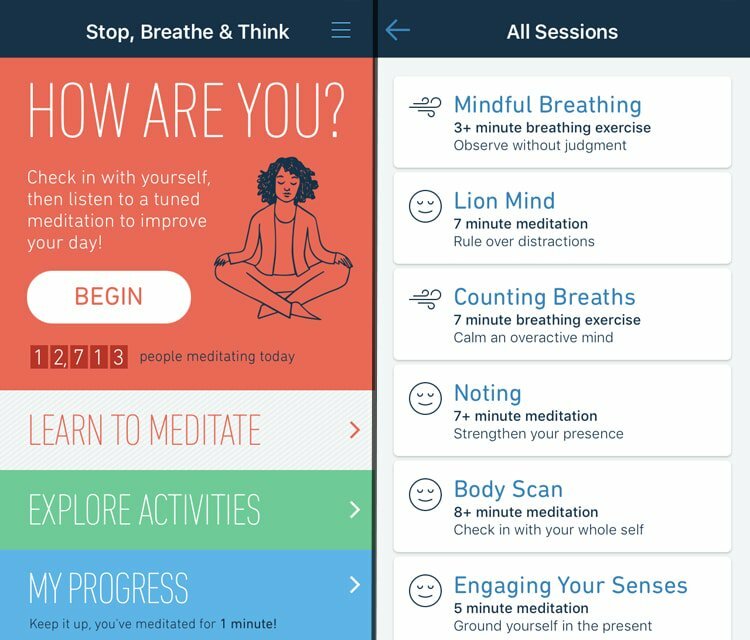 General Layout: While accessible to anyone, this app is great for people who are not sure why they should meditate and would like to learn some of the science behind the practice. The home screen invites students to Learn to Meditate, Explore Activities, and check in on My Progress. There are over 55 guided meditations and the app focuses on education and has a beginner-friendly look and feel. Points of Interest: The app has a daily mood tracker, ability to customize chimes, and focuses on overall health including compassion, sleep, depression, and anxiety. Price (USD) as of July 2017 for United States users: An auto-renewing yearly membership for $4.92 per month billed yearly for $58.99 or an auto-renewing monthly membership for $9.99 per month. Fun Fact: To foster their mission, Stop, Breathe, & Think shares 10% of their net revenue with Tools for Peace, a non-profit helping at-risk youth experience the benefits of mindfulness and meditation. Hopefully you'll find at least one of these five apps that work perfectly for you. If you want to play around with some other fan favorites, check out The Mindfulness App, Buddhify, and Smiling Minds. If you are looking for a simple and free app that is easy to customize, Enso works amazingly! Feel free to share below your reviews, experiences, and helpful tips about meditating and apps to help.